Fo-ti (Fallopia multiflora) is a plant native to China, Japan and Taiwan. Also known as Chinese climbing knotweed, ancient Daoist texts first recorded its use as a treatment for back pain, insomnia, cancer and tuberculosis. The plant reaches a height of between two and four meters when fully grown. It is comprised of a woody tuber (root) from which the fo-ti is extracted, long vine-like stems and large leaves with white, arrow-shaped, flowers. Fo-ti is best known for aiding hair growth and preventing hair loss, but it boasts a host of other health benefits, as well. Fo-ti is well-known and widely used for its hair growth and hair rejuvenation benefits. Many studies suggest the herb’s may help prevent hair loss and restore color to graying hair (x). So how exactly does fo-ti stop hair from graying? Scientists believe it contains compounds that balance the endocrine system, which contains hormone-producing glands responsible for hair loss and graying (x). Fo-ti also has high amounts of zinc, which aids hair growth and restoration (x). Inflammation isn’t always a bad thing: it occurs when your immune system activates to repair damaged tissue. But when it worsens, it becomes a chronic, common ailment for many people. The characteristics of inflammation can range from swelling and redness around the damaged area to heat and severe pain. Research suggests that fo-ti contains certain compounds that work together to stop inflammation (x). One clinical study showed that volunteers who took 250 mg of fo-ti for 14 days showed significant improvements in their inflammation with no adverse side effects (x). Emerging research suggests fo-ti could slow the progression of age-related cognitive decline in diseases like Alzheimer’s and dementia. One Chinese study found a compound in fo-ti, TSG, may support the health of the hippocampus–the area of your brain responsible for memory (x). This could help prevent or slow the progression of diseases like Parkinson’s and Alzheimer’s (x). Fo-ti may help relieve menopause symptoms like hot flashes, night sweats, mood swings and more (x). This is because it mimics estrogen, balancing out hormone levels in menopausal women (x). Studies suggest that along with other herbal remedies for menopause like dong quai, black cohosh, red clover and soy, fo-ti could serve as a natural alternative menopause treatment (x). Some research suggests fo-ti could promote healthy sleep and relieve insomnia (x). Scientists believe compounds in fo-ti promote feelings of calmness, relaxation and wellbeing, alleviating anxiety in those with bi-polar disorder, generalized anxiety and depression (x). Fo-ti’s calming effect may also make it a natural sleep aid. As long as you adhere to the recommended dosage, fo-ti is safe to take for healthy adults. However, taking fo-ti in large amounts may lead to liver damage in adults and children. Talk to your doctor before taking fo-ti if you have diabetes, as it may influence blood sugar levels. You should also talk to your doctor before taking fo-ti if you have a history of liver disease or a hormone-sensitive condition like breast, uterine, or cervical cancer. Do not take fo-ti if you are nursing or pregnant. Mild side effects may include stomach upset, diarrhea, nausea and indigestion. You can find fo-ti supplements in hair complexes, capsules and pills. Fo-ti extract powder is another form of the supplement, and contains a high concentration of the herb’s beneficial compounds. If you opt for the powder, take 2,000 mg (about 3/4 tsp) daily with food, or as directed by your physician. You can mix the powder into juice, smoothies, tea or the beverage of your choice. 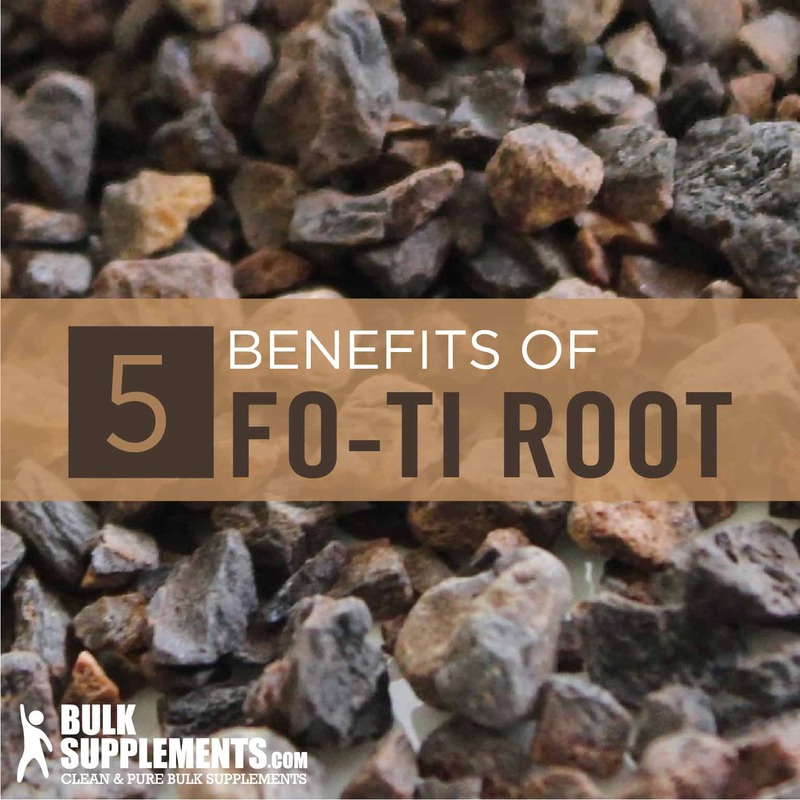 A staple in Traditional Chinese Medicine for centuries, fo-ti can benefit your health in several ways. It may keep your memory strong, relieve anxiety and insomnia, ease menopause symptoms and inflammation, and even stop hair loss.